Get access to the Lazy Goldmaker's Premium TSM Setup! Yes, I want to level up my gold making! Once upon time I looked in envy on the people that could afford epic flying. Imagine having 5000 gold to spend on that! 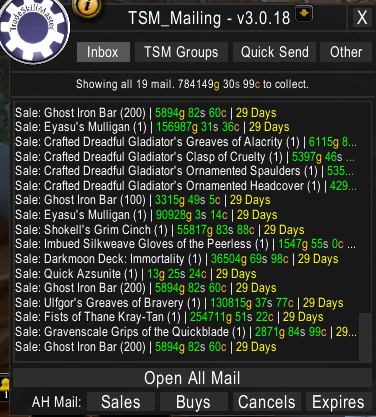 After applying myself to the craft of gold making I am now a gold millionaire and I paid for the latest WoW Expansion with my gold! I have been sharing my methods with you guys, but I can still do more to help YOU reach YOUR gold making goals. I will continuously work to make sure that the Patreon reward tiers offer meaningful rewards for supporting my page. Eventually you should be able to get mailboxes like this! This is why my Patreon page exists! ANYONE can become a WoW millionaire using my methods, and many of you have already done so just using the free resources and guides on my blog! So you can just imagine how you can benefit from getting access to the Patron benefits.